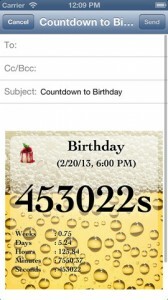 Reminder & Countdown Free is an iPhone app developed by Sergey Astakhov. 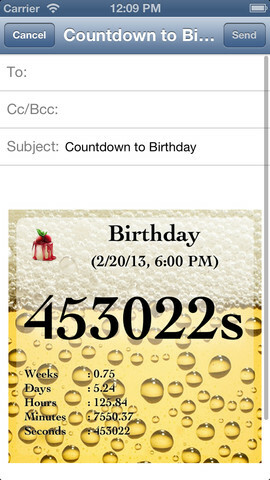 This free app will help you keep track of upcoming holidays, due dates, and other important life events with a countdown-style interface. 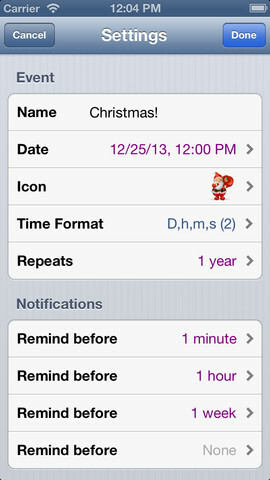 All details of your notifications can be customized: font, icon, sound, background, etc. In addition, Reminder & Countdown Free is complemented with excellent sharing options: you can share reminders that are germane to your other friends via text, email, Facebook, Twitter and Tumblr. 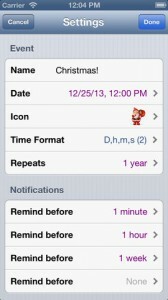 You can also set up push notifications to remind you about events! 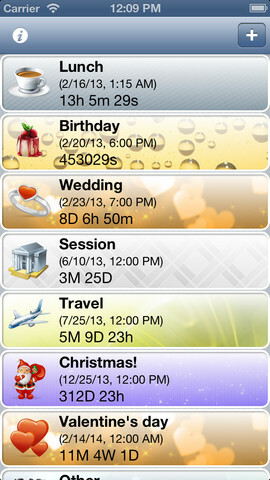 The Reminder & Countdown Free app comes pre-loaded with three countdown screen events: Christmas, New Year’s Eve, and Valentine’s Day. It’s actually kind of handy, but I wish that it was easy to add other holidays or national events to the list. That being said, adding a new event is really easy. 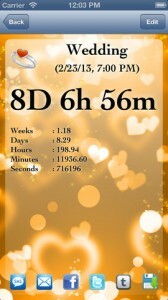 Tap the “+” button, enter the event’s name, date, and icon, and you’re all set. You can also set up when you’d like to be reminded: days, weeks, months, or years ahead of the event’s actual date. One thing that is kind of annoying is the large banner ad along the bottom of the screen. You can get the ads removed via an in-app upgrade, which will also let you select photos for your reminders and import data from your address book. Upgrading to Pro will cost you 99 cents, but can’t be done via in-app purchase. You buy the Pro version, and then it will take the info from the free app and import it. 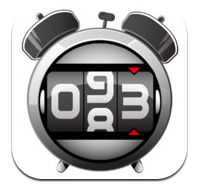 If you need a free countdown tool to remind you about upcoming holidays, birthdays, events, meetings, errands, or appointments, Reminder & Countdown Free has got you covered. It’s free, functional, and while not terrible pretty, works just fine. 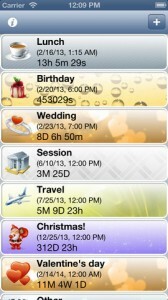 Reminder & Countdown Freeis compatible with iPhone, iPod touch, and iPad. Requires iOS 5.0 or later. This app is optimized for iPhone 5.